Tens of thousands of people from Kurdish and Alawite communities gathered in the German city of Cologne to protest presidential policies, as well as the Turkish government’s crackdown on opposition and journalists. The massive rally held on the Deutzer Werft embankment not far from the city center was initially organized by the European Alawite Association but later was joined by the Kurdish community that called off its own demonstration in the German town of Dusseldorf and instead decided to rally together with Alawites in Cologne, police spokesman, Benedikt Kleimann, told the regional WAZ newspaper. Demonstrators urged European countries to “act” and influence Turkish authorities in order to stop them from continuing the ongoing crackdown on opposition politicians and journalists. Some Kurdish protesters could be seen waving flags bearing a portrait of the leader of the outlawed Kurdistan Workers’ Party (PKK), Abdullah Ocalan, who is serving a prison term in Turkey. The rally was attended by the head of the German Association of Journalists (DJV), Frank Ueberall, who called for international solidarity with the journalists that were fired and detained in Turkey. “Many colleagues, whom I visited … in Turkey in the last months, are either unemployed or detained now,” he said at the protest, as citied by the German media. The demonstrators also protested against the recent detentions of journalists and opposition politicians in Turkey. On November 4, Turkish authorities arrested the two leaders of the pro-Kurdish HDP party (Peoples’ Democratic Party), Selahattin Demirtas and Figen Yuksekdag, as well as 13 other legislators from the party, as part of a terrorism investigation. Over 1,000 HDP members have been formally arrested in the past year, according to Reuters. In late October, Turkey also arrested the editor-in-chief and several columnists of the independent Cumhuriyet newspaper, also raiding the homes of the paper’s executives. Earlier, Turkey also detained some other journalists that were critical of the government. The head of the UETD, Bulent Bigli, dismissed all these accusations and called them “unashamed and arrogant”, stressing that his organizations contributes to integration and fights against creation of any parallel societies, DPA reported. Although the rally was generally peaceful, there have been some clashes between Kurds and police. A Kurdish man tried to light a pyrotechnics not far from the place where the rally was held. When police approached the man, he attacked the officers together with some 120 Kurds, DP reported. Police were pelted with bottles and stones. One female officer sustained injuries in the incident. Another group of protesters tried to join the scuffle. Police used batons and pepper spray to disperse the crowd. The man, who initiated the fight, was taken into custody.The post-coup crackdown in Turkey has seen over 35,000 people detained and tens of thousands of civil servants fired. Initially, the government-led purges only targeted people suspected of being supporters of Fethullah Gulen, a cleric who lives in self-exile in the US , whom Ankara accuses of being behind the July 15 failed coup attempt. However, now PKK-links are also increasingly being cited as reasons for arrest, as was the case with the recent detainment of the daily Turkish newspaper Cumhuriyet’s editors and executives. The new wave of arrests provoked public indignation both inside Turkey and in Europe. 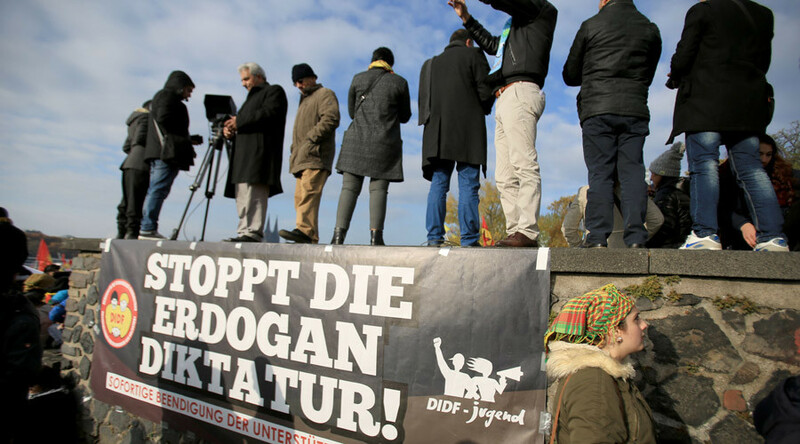 On November 5, hundreds of people took to the streets of several German cities, including Ankara and Istanbul, to protest against the government’s crackdown on dissent.Protests were dispersed by police. "I don't care if they call me dictator or whatever else, it goes in one ear, out the other. What matters is what my people call me,” Erdogan said following the protests in Europe on November 6.